On 7 August 2014 ITV published an e-book, Kate Parry Frye: The Long Life of an Edwardian Actress and Suffragette. Based on her prodigious diary, this is my account of Kate Frye’s life and was a tie-in with the ITV series ‘The Great War: The People’s Story’. For details of the TV series and its accompanying books see here. As a lead-up to publication I shared some entries from Kate’s diary from the month before the outbreak of war. Through her day-to-day experience we can see how the war stole up on one Everywoman. Kate was at this time 36 years old, living in a room at 49 Claverton Street in Pimlico and working in the Knightsbridge headquarters of the New Constitutional Society for Women’s Suffrage. It was now nine years since she had become engaged to (minor) actor John Collins. Her father died in March 1914 and her mother and sister, Agnes, now all but penniless, are living in rented rooms in Worthing. John has a room along Claverton Street, at number 11. It simply came down in sheets. I had a rest and got up late. John came in at 12 – we had meant to go into the country but it was awful and so tiring as there was thunder in the air and every now and again it seemed most oppressive. We went out at 1.30 – bus to Trafalgar Square. We did not know where to go so dashed in a restaurant in the Haymarket – very expensive and full of smart people – so, as we were anything but smart, it was rather awful. However we had a very good lunch and bore our shabbiness with as much of an air as we could. It was still pouring when we came out so there was nothing for it but to come back. John did some typing and then we had tea – and went out again at 6. Walked all along the Embankment and over on the other side by St Thomas’ Hospital. 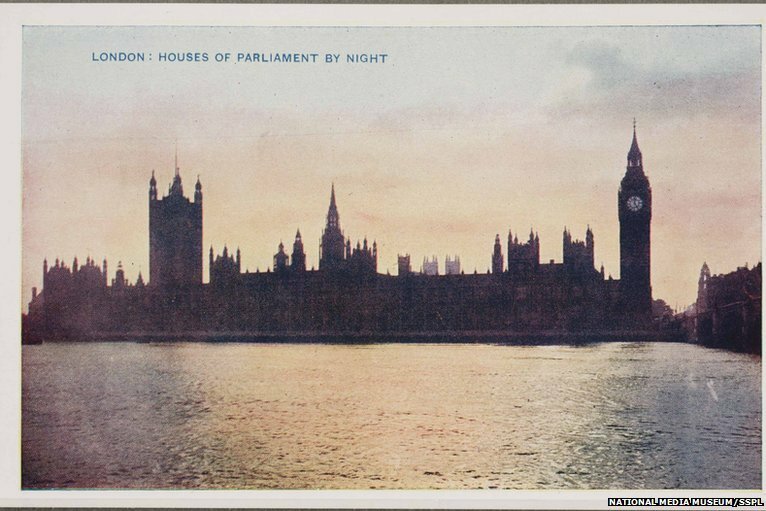 The Houses of Parliament do look lovely from there. Over Westminster Bridge and we sat in the Charing Cross Embankment Gardens until 9 when we were turned out. Then to Appenrodts in the Strand for some supper and a very delicious salad. Back by bus. Not in till 11.30. Kate and John’s 12 July 1914 is the epitome of a peaceful, rather boring, London Sunday. I daresay we’ve all spent a day like this. The kind of day when it rains and rains and then clears up for a watery sunlit evening. Neither Kate or John had cooking facilities in the room – hence the regular eating out. Hermann Appenrodt had come to London in 1886 from Germany and had launched a very successful chain of delicatessens and restaurants. 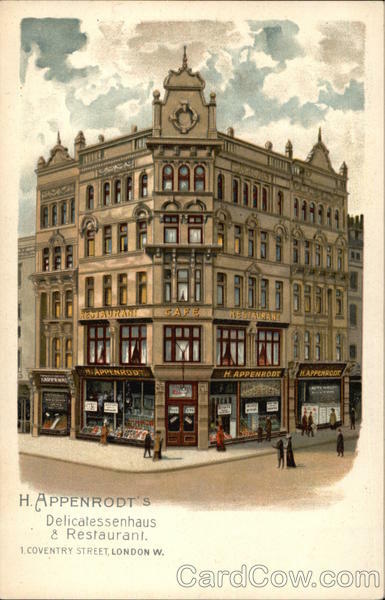 In 1914 he had three branches in the Strand. Appenrodt also had a branch in Paris which, a little over a month after Kate and John had enjoyed this Sunday supper, wa sto be badly damaged by an anti-German mob. This entry was posted on July 12, 2014, 11:52 am and is filed under Kate Frye's Diary. You can follow any responses to this entry through RSS 2.0. You can leave a response, or trackback from your own site.